Imagine getting married to your partner weeks before you succumb to brain cancer. Now imagine experiencing that as a musical. Odd pairing of subject matter to style, right? But that’s what The Last Party from Next Step Productions offers us at this year’s Toronto Fringe Festival in this near-tearjerker. 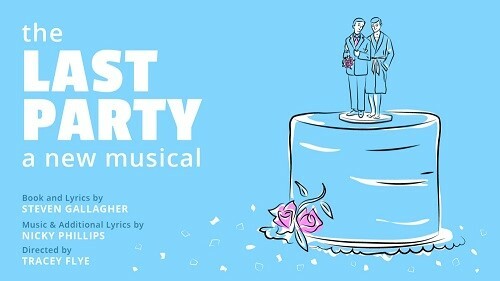 A mixture of laughs, prose-style lyrics and dramatic scenes, The Last Party welcomes Michael Lomenda back to the Toronto stage post-Jersey Boys. Lomenda plays the lead, Dylan, in this new miniature musical from co-writers Steven Gallagher and Nicky Phillips. The cast is rounded out by the British boyfriend (Jeremy Legat) and Dylan’s sister Ruth (Jessica Sherman). All three are strong singers, however – due to the limitations of the Fringe – the simplified orchestrations for keyboard and cello don’t always match the performers’ intensity. The show often employs flashbacks to flesh out the emotional lives of the couple. They are used to recall Dylan’s first crush and the engaged couple’s proposal and first meeting at a backyard barbecue, when the gentlemen perform the only duet. The scene of Dylan revealing his diagnosis to Ruth an hour in felt anticlimactic. Probably because the show is still figuring out the right order for its content. While I enjoyed the Awkward number as Ruth’s waters broke, following the character’s journey chronologically might have been more useful. One of the biggest challenges of the piece is the introduction to Dylan. He begins in bed, combative towards his partner and repeatedly demanding milkshakes, a rewritten eulogy and everyone’s undivided attention. These are hardly traits that endear his character to us and they strained my belief in his chemistry with Trevor. Ultimately, while the show is called The Last Party, I felt a bit confused which party it’s really about: the ‘celebration of life’ that Dylan wants to throw in ten days – as per the titular song – or Trevor and Dylan’s wedding later this same day. As a result, the tension diffuses between these two planned gatherings as the musical steps back in time again. Quality work from Sherman in her all-too-brief starring moments, an anchoring presence from the goofy Lomenda and Legat’s cute, crisp and cool Trevor help present this still-in-the-making material to its best advantage. Hopefully this is just a step towards another party and not the Last one.